The crypto market is experiencing another drop which has brought the total market cap to $111 billion (as of the daily low). The majority of coins are currently trading in the red. The price of Bitcoin (BTC) has dropped below $3,400, while its market cap struggles to stay above the $60 billion marks. Other major coins, such as Ripple, Ethereum, and Litecoin are experiencing drops below 1% at the time of writing, while EOS is down by over 3%. Meanwhile, Stellar (XLM) is losing the most among the top 10 coins, with a 6% drop over the last 24 hours. The drops benefit with the position of the only stable coin among the top 10 coins, which is Tether (USDT), that continues its way up on the top list after reaching the 4th place earlier today (as of writing this Tether lies on the 5th place, very close to EOS). Tether ‘enjoys’ the declining market caps of the other leading coins and surpasses them. Tether, the most popular stable coin, is pegged to the USD, even though it had seen fluctuations in its value ($0.96 – $1.04 range) over the past year. Stablecoins like Tether play a major role in the crypto space, particularly during bear markets. As a digital coin pegged to a FIAT, USD in this case, the stable coin maintains its value. 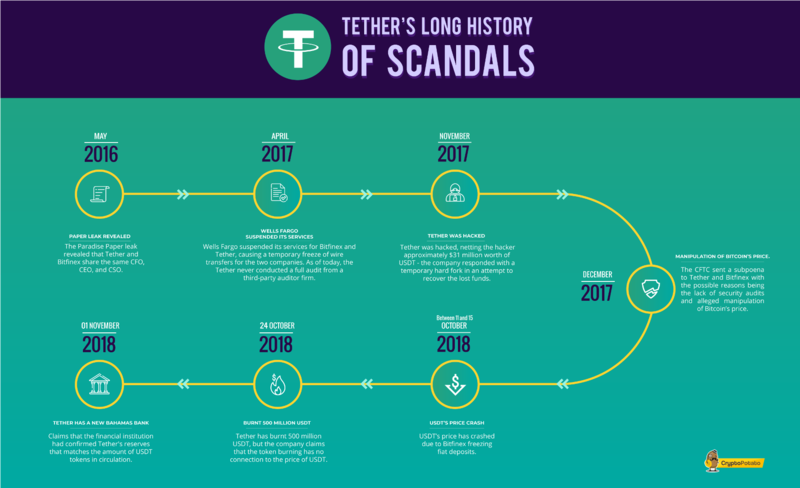 Tether became very popular during the bear market of 2018, even though it went through many scandals. As can be seen on the chart above, Tether is responsible for the vast majority of the trading between crypto and FIAT or stable coins. This raises the question of what devastating results could happen in the case of possible problems or issues among the popular stable coin. Over the last year, many new stable coins were created. 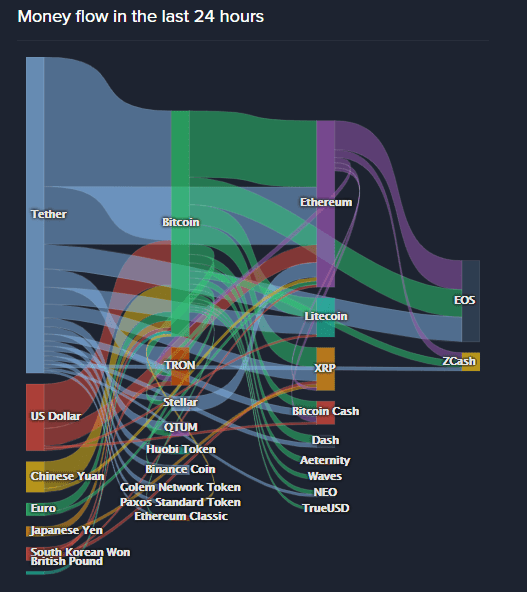 Some of them include USDC (by Circle), TUSD (which is traded on Binance) and GUSD (Gemini Dollar by Gemini). However, despite the rising contest in the stable coins’ market, the next largest stable coin on Coinmarketcap is TUSD with only $200 million market cap (USD Coin has some fake volume according to Coinmarketcap).